← Infuriated and cannot show it yet, I’m starting to show stead cracks. I used AAA’s nap time to do a few small house projects because his potty training is driving my crazy. He’s a smart boy and while I knew it I’m learning just how smart he is. 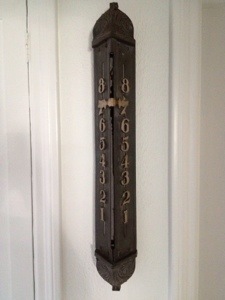 Anyway, my happiness came from putting the 1940′s elevator floor indicator up in the house. It’s very deco and weighs about 25 lbs of iron. I also moved items around in the almost 2nd bath – I can almost see it. This entry was posted in Fatherhood, Homo Decor', My happiest moment today:, So, anyway ~. Bookmark the permalink.